This area is designed specifically for our GWRRA Rider Course Instructors. All of the GWRRA Rider Course material is copyright intellectual property of the Gold Wing Road Riders Association, Inc. No part of any Rider Course material may be used in whole or in part, except by an authorized GWRRA Rider Course Instructor, without the expressed written permission of GWRRA. All rights are reserved. Our Mission..."To Save Lives Through Quality, World Class Education" is a creed we live by. Over many years of development by hundreds of dedicated GWRRA Instructors throughout our association, our program has developed to become truly "World Class". We offer one of the most extensive Rider Course curricula in the world. From courses focusing on Motorcycle, Trike, and Sidecar, to our specialty courses on Trailering and (soon to be released) Trike Trailering, no one has more to offer. 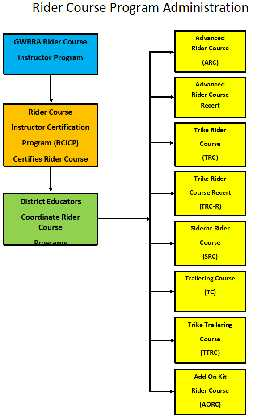 To apply to become a GWRRA Rider Course Instructor, download the N.13A and send it to your District Educator. For further information contact Chuck Geggie.